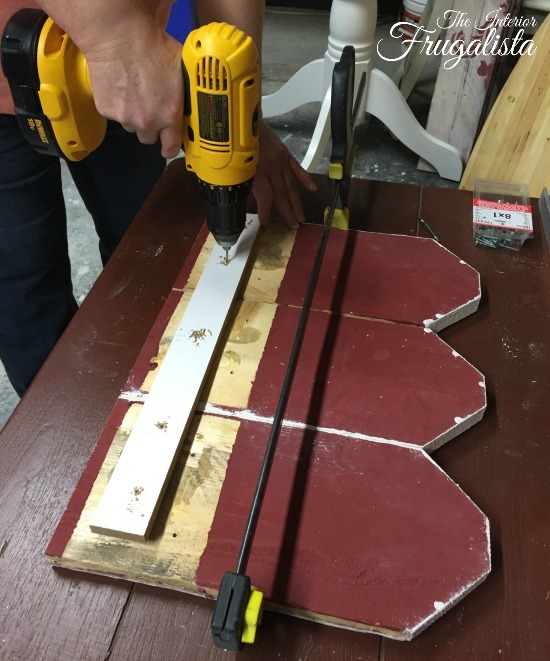 It's time for another Power Tool Challenge and this month's theme is Repurposed. Now that's a challenge after my own heart and the timing couldn't be more perfect. A couple of weeks ago we helped our daughter and her family move. Now that she's unpacked and settled she wants to create a coffee station on one end of her kitchen counter. 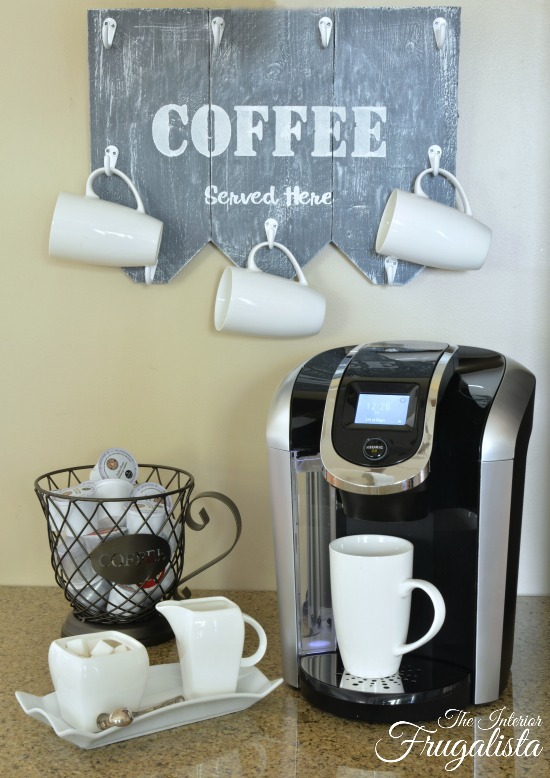 She also wants to clear some valuable storage space in her cupboards by hanging her coffee mugs on the wall behind her coffee maker. That's where this challenge and her Mama comes to the rescue. 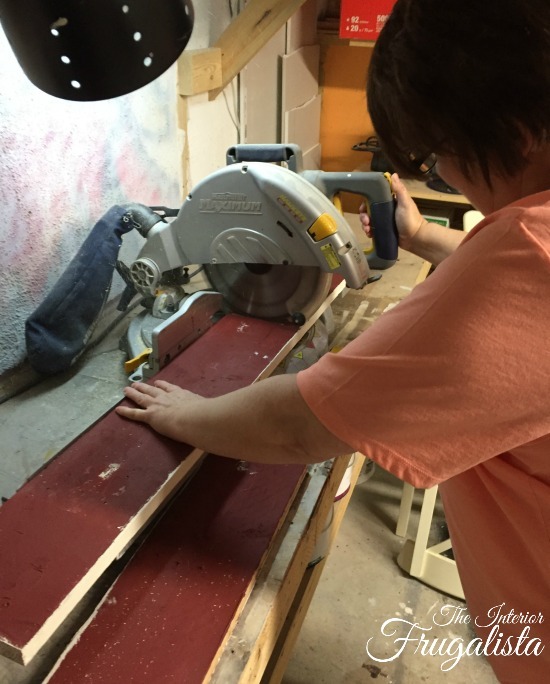 Before I get into the details of the How To, if any of you haven't heard of the Power Tool Challenge, it is a group of tool savvy, skill sharing bloggers who come together each month to help encourage and empower our female readers to step out of their comfort zones and try basic power tool projects. In case you missed it, last month I Repurposed an antique chair back into an Antique Chair Back Bird Feeder. 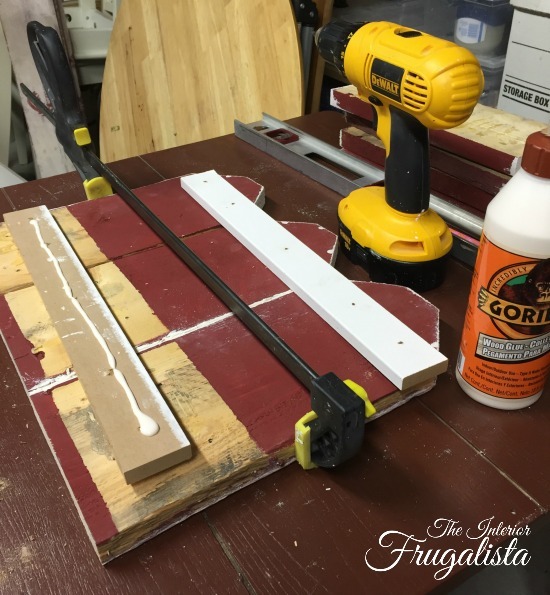 For this easy peasy Coffee Mug Holder, I used two power tools; a Compound Miter Saw and a Power Drill. Several years ago I made a set of wooden shutters out of fence boards and had them flanking a mirror in our dining room. Last year when we added a Board & Batten wall in this space, the shutters came down and have since been collecting dust in the workshop. While coming up with an idea for this challenge, I knew those shutters would be perfect repurposed into my daughter's under cabinet coffee mug holder. The challenge, however, was that the space between the base of her kitchen cupboards and the top of an electrical outlet is only 20" wide x 13" tall. I thought it would be fun to salvage the tops of the pickets and have them point downwards towards the coffee maker. The first order of business was to remove the battens on the back of each shutter. Thankfully I assembled them with screws which made them very easy to take apart. Remember above I mentioned that there are only 13-inches from above the electrical outlet to the bottom of the upper kitchen cabinet. 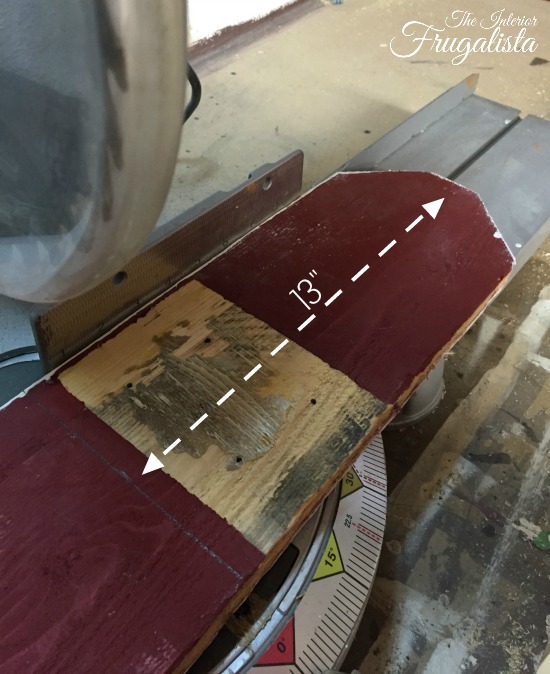 I measured each board from the top of the gable point to 13-inches and drew a pencil line with a straight edge. With a compound miter saw, I cut each board on the generous side of the pencil mark. That left a whole lot of leftover board and being one to who doesn't like to waste, I built a computer monitor stand for my office (I'll share that in an upcoming post). The width of three shutters equals 18-inches, perfect considering the width of her wall is 20-inches. 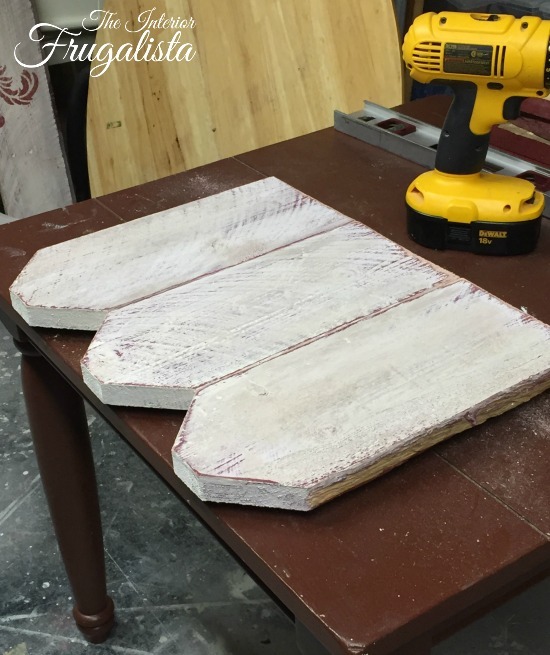 I flipped the boards upside down and lined them up evenly and clamped in place. 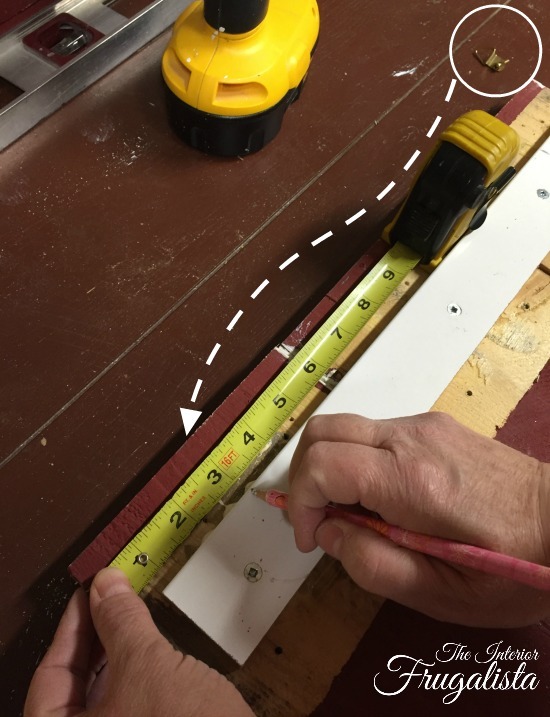 I found two pieces of MDF trim in the shop and luckily they were the perfect length. Yay, no cutting required. MDF has a tendency to split so I made pilot holes with my drill using a 3/32" pilot hole bit. I applied wood glue to the back of each one and then attached the battens with #8 1-inch wood screws. I measured 3-inches from each side and attached triangle picture hanging hooks (D-hooks work just as well). 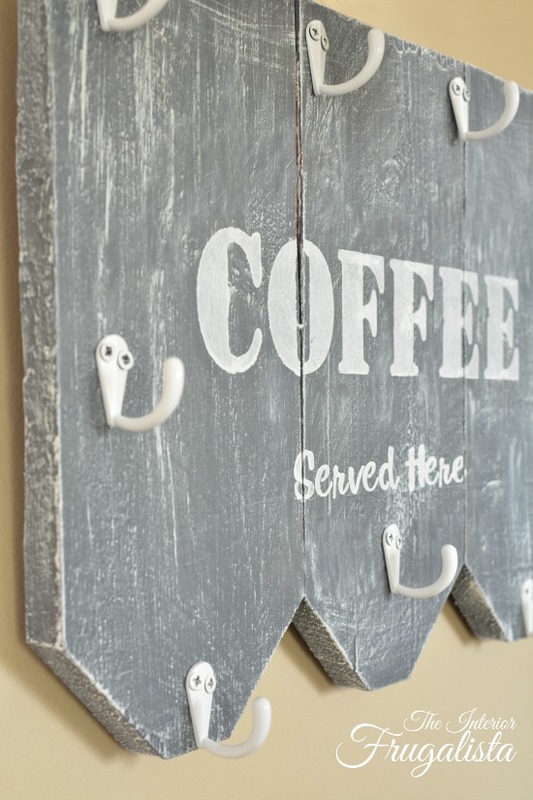 Tip: To keep the triangle from flopping downwards when trying to hang the coffee holder, mount the triangle so it rests just slightly onto the batten and stays pointing upwards. Saves you a lot of headaches later when hanging it on the wall! Now that the coffee mug holder is assembled it's time for the fun part, making it pretty! Using chalk paint, I brushed two coats of the color Hurricane. Next, I dry brushed Simplicity White which made the knots and grain in the wood pop as well as giving it that rustic look I was going for. Note: The dry brushing technique I used was dipping just the tips of my paint brush into the paint and dabbing the excess off onto a paper towel. With a light amount of pressure, I ran the brush in long vertical strokes. 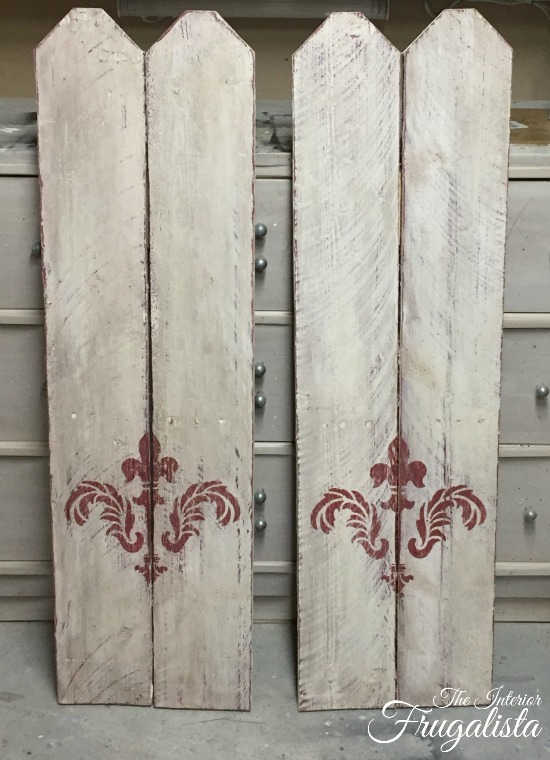 I decided to use white hooks to tie in with the white stenciled detail. I wanted as many hooks as the mug holder could handle and hoped it would be an even 10. Unfortunately, I could only fit nine. I laid the hooks out and placed a mug on each one like they would be if hanging vertically on the wall. Once I had them lined up, I measured them evenly across the boards using a tape measure. With an awl, I pressed firmly to make an indentation in the wood to mark where the screws for each hook will be mounted. If you've been following me for some time then this stencil will look familiar. 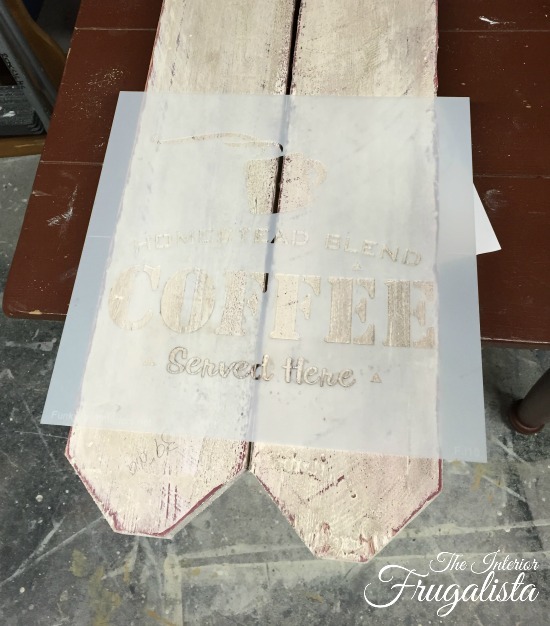 It's from the Coffee stencil line at Funky Junk Interiors. I used it on a Rustic Serving Tray Makeover a few months ago. 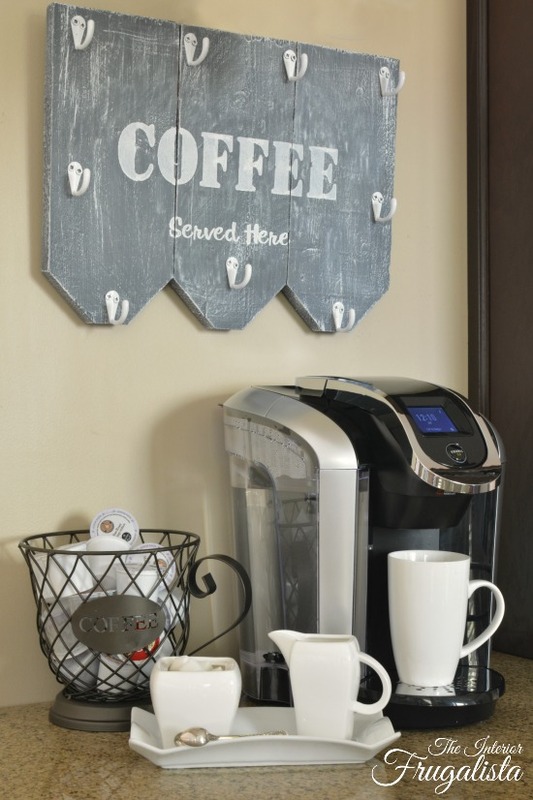 Now that you have the hooks and mugs all lined up on the mug holder, mark where you want the words COFFEE and Served Here with a piece of painters tape. 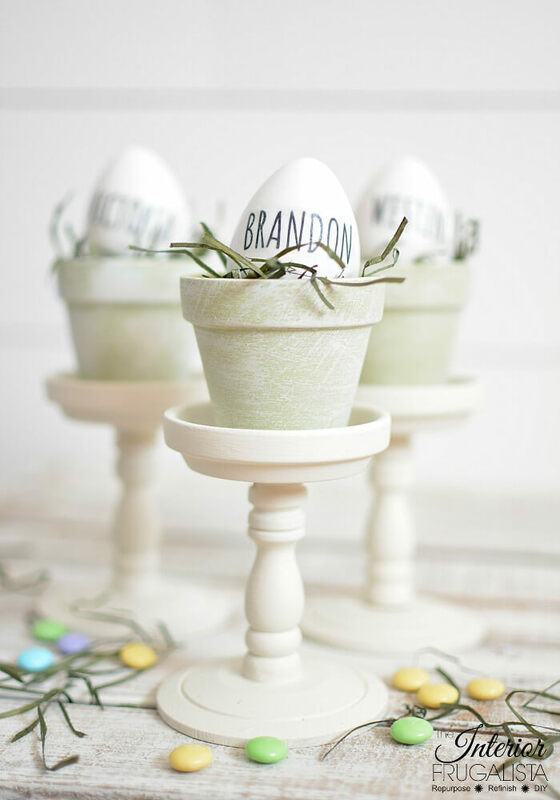 Remove the hooks and mugs and line up your stencil so it's centered vertically between the mugs. 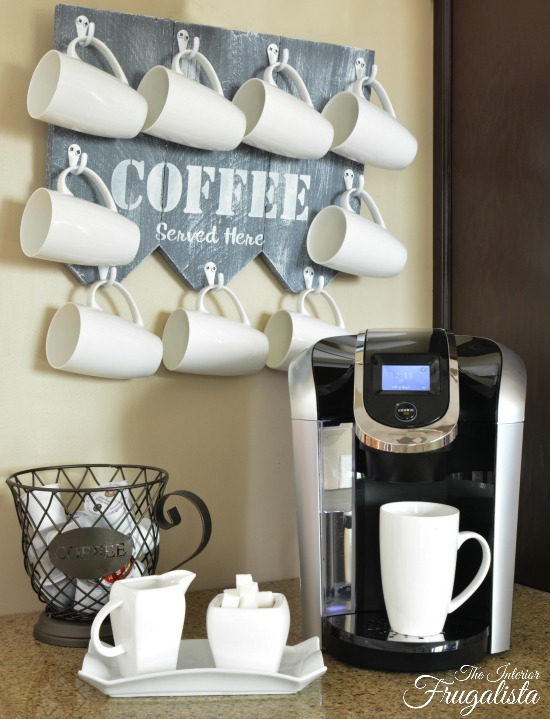 Line the cup hooks with the holes and screw the cup hooks in place. That's all there is to it! This project is hot off the press so it hasn't made it's way to my daughter's kitchen coffee station yet. Hi Lovey, I hope you like your new coffee mug holder! The pictures were taken from a wall in my kitchen. 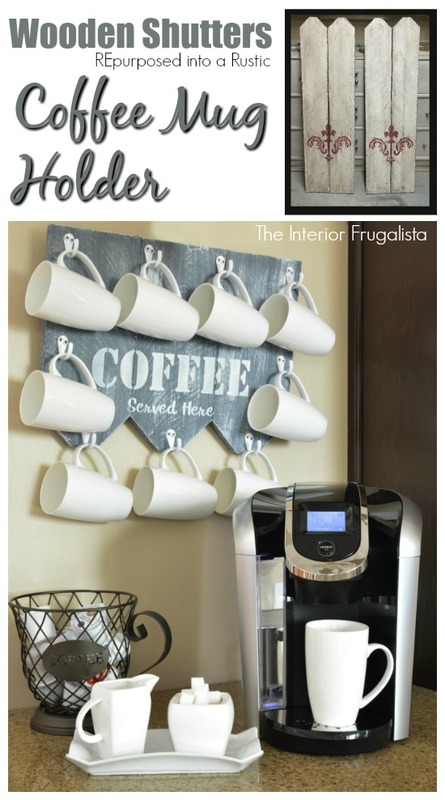 If you enjoyed this Rustic Coffee Mug Holder tutorial and know someone who might like one in their home, please share it with a friend and/or save it on Pinterest. 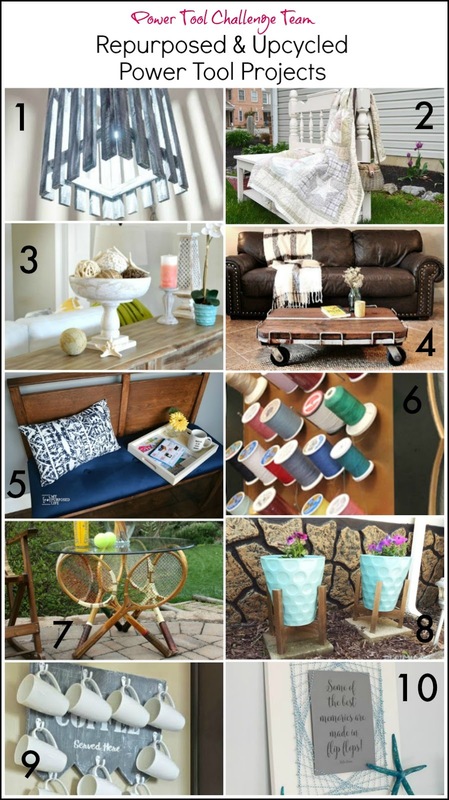 Let's head over to see what the talented gals in this group Repurposed for this challenge. Judging by the photos below, they created some pretty amazing projects! Press the links below to visit each of their blogs. much more attention. I'll probably be back again to see more, thanks for the advice! Glad you enjoyed this project and you'd like to come back to see more. Welcome!